Unless you're a bonafide sommelier or have simply resigned yourself to swilling Two Buck Chuck for the rest of your days, then chances are your taste in wine is a process of trial and error involving funky $15 glasses of wine at restaurants or erroneously giving Pinot Grigio another chance. But now, a California-based startup claims it can take the expensive guesswork out of buying wine by matching you with wines based on your DNA. Really. As explained in a report by Munchies, Vinome says it can set you up with the perfect bottle of wine by analyzing your DNA, creating a "unique taste profile" with the results, and actually sending you bottles from California wineries based on your genetic information. Apparently, the process is as easy as a simple saliva swab test, which they mail to you in a kit, and a survey of your basic flavor preferences. The analysis involves looking at genetic markers associated with taste and smell, the results of which will be shared with you online. From there, the company will determine which wines it believes you're most likely to enjoy. Fascinating, right? But don't get too excited about simply uncorking a sommelier-level taste in wine -- unless you're willing to pay up. As you may have guessed by now, Vinome's DNA test and resulting wine-pairing services come price tags that rival, well, expensive wines. The test alone is $199 and if you end up buying the wine Vinome recommends, bottles will set you back about $65 each with a minimum order of three, according to the report. But there's no guarantee the service will actually find the most magnificent merlot of your dreams, seeing as such DNA testing doesn't account for flavors you've learned to love over the years and other factors. Oh, and the word overkill might also come to mind. Sure, getting a DNA analysis of what wines you might be programmed to enjoy would be interesting, but just think about all the different bottles you can try with that much cash at your corner wine shop. Seriously, people, how can you go wrong with a $5 red blend? You can't. Cheers to that. 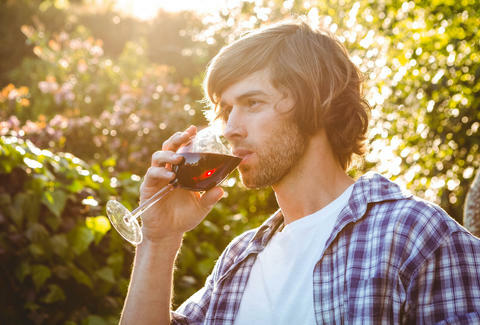 Tony Merevick is Cities News Editor at Thrillist and is fascinated by this, but doesn't think he needs his DNA to be analyzed to tell him what types of wine he'll enjoy (the answer is, of course, "all of them"). Send news tips to news@thrillist.com and follow him on Twitter @tonymerevick.